This German design combines the most noble components such as oak, walnut and metal. The sideboard will look stunning in the living room or any other area of the house, depending on the intended usage. 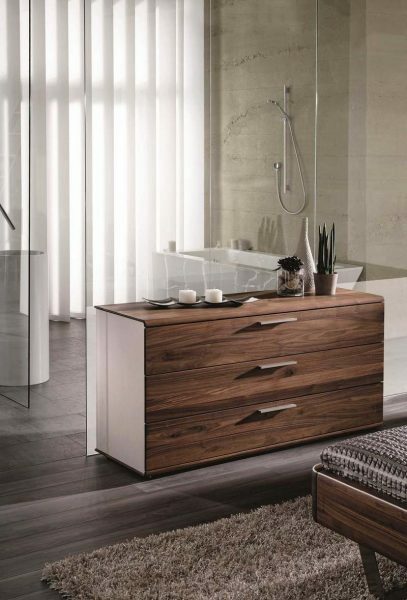 This luxury furniture is available in oak or walnut wood and can be combined with metal accents as well. Choose between different sizes and finishings and compose a contemporary setting that reflects your style of living today! This furniture item must be attached to a wall to prevent any risk of tipping over. We will supply a free maintenance kit including a 250 ml bottle of oil and a polishing cloth so that your high-end furniture gleams all year round.